Famous D.A.R.E. 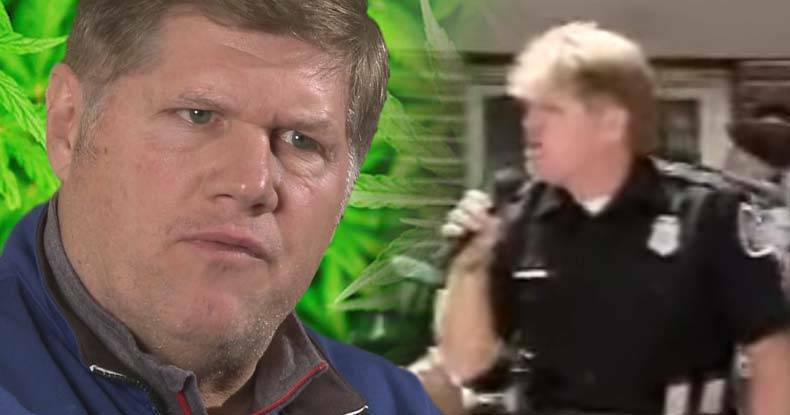 cop reveals his thoughts on medical marijuana after using it as medicine for himself. The truth about marijuana has finally liberated an old famous D.A.R.E. cop, Darren White after he has realized its healing potential for himself. The story of this police officer’s complete attitude turnaround towards marijuana is actually inspirational for the marijuana movement. It is an example of how powerful the healing properties of marijuana are, as well as an example of how strong the movement towards greater marijuana awareness is. Darren White is no longer putting people in jail for using marijuana but is instead focusing his energy on legalizing it as medicine so that all those who need it will have access to it. It is a brave act for Darren White to come public with his thoughts on medical marijuana after a career disallowing people from using it. White admits that he was never in favor, even of medical marijuana, despite watching his father die of cancer. He just did not believe that the comfort could be acquired from marijuana use. This is why he spent the better part of his career in a D.A.R.E. band, singing to children about how marijuana would ruin their lives. However, after recently undergoing surgery and being prescribed chemical pain killers, Darren White has completely changed his opinion about marijuana. “I had reasons for why I believed what I did. I’m not ashamed to sit here and tell you I was wrong,” White claimes after using marijuana as an alternative to chemical pain medication. After having a leg reconstruction and back surgery, White said he could identify with the amount of discomfort experienced because of chronic pain. He now knows that medical marijuana works, and he holds a card to be able to obtain it. Americans are making a complete shift from chemical medication towards the natural medicine offered by marijuana. People are becoming more conscious of all of the negative side effects that come from using pain medication, emotionally and physically. White says, “Consuming a steady diet of painkillers doesn’t equal a quality of life.” It is becoming more and more common for people to make the move towards medical marijuana. It is safer, healthier for the body and it is now scientifically proven to be effective. This story is a perfect example of the marijuana movement in action. Activists have been working hard for decades now to shift the public opinion of marijuana, and we are now living in an era where police officers and politicians are changing their minds about marijuana. There are more and more politicians on the rise that are supporting marijuana legalization, and this story takes shifting public opinion to a whole new level. Well, it isn’t easy to publicly stand up and support something that you spent your entire career demonizing, especially when all of your old friends are still in the business of demonizing it. It is a respectful thing that Darren White is now dedicating his time an energy to a cause that is truthful, the legalization of marijuana. The hard work of the last few decades are beginning to pay off, with even old D.A.R.E. cops changing their mind about our favorite herb! What do you think about Darren White’s thoughts on medical marijuana? Let us know your thoughts on our social media or in the comments section below.